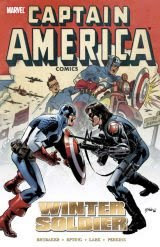 Wish I'd liked this one more, Brubaker's writing is top notch but I just don't care for the can of worms he opened in the telling of the story. As a result, it gets recommended as worth reading but I can't give it the wholehearted endorsement that I'd normally give something written this well. 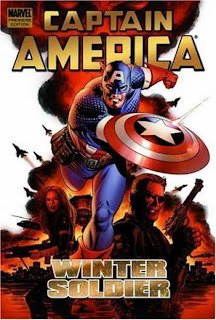 Basically, the Skull is dead and Cap has a new enemy to face with the power of the Cube, but there's another danger closer to home that could destroy Cap forever! All the clues point in a particular direction--but that's just crazy. Good stuff it just went somewhere I wish it hadn't. Again, great storytelling but I just can't stand what it meant to the Marvel universe as a whole. I also thought the ending was too much of a cop out, especially given we've seen it before, at least twice by my count. A writer of Brubaker's stature can certainly come up with something better. The conclusion of the Winter Solider storyline--can Cap stop a mad Russian with the cube before it's too late? And what about that Winter Solider guy? Is he really who we think he's supposed to be? Well, you probably know by now, but here's where first reveal happens, along with some more changes in characterization that just don't square, not unlike how Brubaker handled Batman and from what I understand, the X-Men. I find the story to be good, but man, wasn't there a way to tell this story without it changing the Marvel Universe? Again, recommended, but be wary if you're a long-time Cap reader.